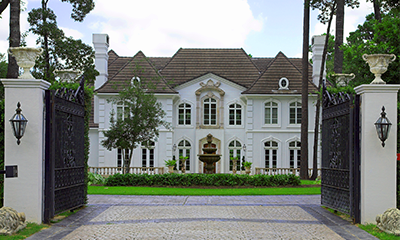 Find a Mansion and Luxury Homes in Dallas, TX. To change how the search is displayed, click the gray button next to "Sort By." Using the gray button below, you can sort homes by prices or days on market. For information about Luxury properties for sale in Dallas, Texas, or to request a showing, click "Schedule a Showing" when viewing any Luxury listing. You can also create and save a custom home search by clicking the "Save this Search" button and register for a free account. A custom search will allow you to receive email alerts when a new mansion for sale hits the market. A custom search also puts you at an advantage over other buyers in the market by keeping you "in-the-know" at all times. KnoxRE.com is updated every 15 minutes by a direct feed from the local Dallas-Fort Worth MLS which will give a visitor desired information for mansion properties like images; days on market; subdivision information; feeder school information; HOA dues; frequency of the HOA dues; estimated county taxes and more. If you see a property displayed, it means the home is still available for purchase. Our site only displays currently active Mansions for sale. If a listing goes under contract, it is removed from the listing display for ease of use and navigation for visitors. To view more Dallas home listings, see the alphabetical list of subdivisions in the area below. Click on any of the listed subdivisions below to visit that neighborhood's page. If you would like to view all Dallas real estate listings, click on the link at the top of the page. Both North Dallas and Northwest Dallas hold some of the most expensive luxury real estate in the area. In North Dallas, the following subdivisions and areas are favorite places to begin your luxury search - Baron, Sunnybrook Estates, Meadowood Estates, Inwood Road, Wilemon, Creeks of Preston Hollow, Glen Abbey at Ash Bluff, Cochran Chapel Road, Lobello Estates, Sanric Estates, Preston Hollow, McFarlane, Oaks at Williamsburg, Wilson Estates, El Parado and Lake Forest. The popular luxury neighborhoods in Northwest Dallas are as follows: Walnut Hill Highlands, Midway Hills Terrace, Lyndhurst, North Ridge Park, Kelman Park Lane, Avalon, Preston Hills, and Caruth Hills. Outside of the City of Dallas, a buyer can also find mansions for sale in Plano, Southlake, Frisco, Colleyville, Westlake, Highland Park, University Park, and Fort Worth. Luxury home plans may be found in a variety of architectural styles like traditional, contemporary, Mediterranean, French, English and European inspired. Typically, the luxury real estate in Dallas will start at $1,000,000 and price up to over $20,000,000 for very special properties. Square footage on these luxury properties start around 5000 square feet but will usually have over 10000 square feet for the very expensive homes. Mansions usually begin in price around $4,000,000. Elevators are de riguer in most luxury homes that are more than one level. In a Manhattan apartment, the elevator doors open directly into the foyer. Interestingly enough, lots of elevator doors open directly into another favorite feature in luxe living, the home fitness center. When you're wealthy you never take the stairs to go work out. The fitness center mimics a private gym in many respects-- unique flooring, state of the art equipment, sauna and steam rooms--just nobody else around and probably better magazines. People who live in luxury homes entertain a lot, and outdoor entertaining is popular almost everywhere in the country. All this party-giving means second kitchens, seating, and dining areas outside--and not just a built-in grill and mini-fridge. These are full gourmet kitchens with cooktops, ovens, dishwashers, and refrigerators--and a built-in barbecue with several cooking temperatures. Vaulted ceilings over a loggia have heat lamps in case the roaring fire in the stone fireplace isn't putting out enough heat. The TVs that hang over these fireplaces are specially sealed against humidity and you can bet the sound system is state of the art, and a tablet controls it all. First and foremost, it's not necessarily a home that's several thousand square feet with a lot of windows. The landscapes are overloaded with gigantic tract mansions--yes, they're big and flashy and have all the trendy doodads, but they're a far cry from true luxury. Real luxury is unique---custom features designed for the homeowner that isn't found in other homes. For a cigar aficionado, a walk-in humidor-- a pair of period cigar chairs, and perhaps a small wet bar so he doesn't have to leave le smoking for a brandy. Wine cellars have been all the rage lately, but a cellar with French champagne racks and custom cedar racks that accommodate the slightly different bottle shapes of Bordeaux and Burgundy--that's luxury. And this cellar and humidor can exist in the finished basements of otherwise ordinary houses. For many homebuyers, getting into the luxury market means lots of upgrades in all the bells and whistles that go into a home. For others, it's acreage or that home gym. Whatever your idea of luxury, please contact us to see the local market in expensive housing. If you're worried you're not quite there yet, consider this. In Silicon Valley, a second bathroom is regarded as a huge luxury--so it is in the eye of the beholder. There's on sure thing about Texas houses in general and Dallas luxury houses in particular--like hair, bigger is always better. But when you're talking about certain styles of homes, the term "luxury" pops up every now and again but doesn't seem to have a standard accepted meaning. You'll see ads for luxury homes in gated communities, at the beach, on ranches, and even in high-rise condos. Luxury is a singular concept--one man's castle is another man's headache. But allowing for differences in style and taste, keeping in mind that you can't fix tacky, what exactly IS a luxury home? The overall definition is a home that's worth more than a million dollars, but real estate prices across the country are so variable that the number isn't a realistic indicator. Five million dollars in Dallas buys a lot more house than the same money in Beverly Hills, where the average home goes for around eight million. For the matriarch of a large family, luxury is a home everybody can come home to--lots of bedrooms and bathrooms, an assortment of sitting rooms and a couple of kitchens--she has limited interest in the latest climate control technology but is vitally aware of the number of water heaters she'll need when all the family comes for Thanksgiving. If she's a gardener, a yard large enough to indulge her passions for plants, and a greenhouse for wintering over delicate specimens, starting new cuttings and cultivating her camellias, roses, or orchids. Aside from unique custom features, there are a few characteristics of luxury homes that are relatively consistent. Size doesn't matter when it comes to luxury since a thousand-square-foot loft in San Fransisco is as high-end as an estate in Connecticut. Luxury properties for sale will be found in almost all architectural styles in Dallas. The luxury homes are built in the following styles: Traditional, Modern, Ranch, Mid-Century Modern, Condos, Mediterranean and more. If there is a distinctive architectural style you want as a luxury house, Dallas will most likely have it. What can buyers expect when they're looking at luxury houses for sale? This is a hard question to answer since the standard price point for the luxury real estate in Dallas is defined as homes over $1,000,000. However, there are certain aspects on luxury properties for sale buyers can almost expect stone counters, elevators, stone and hardwood flooring, large master bedrooms, possible lots with acreage, large kitchens, and spa-like master bathrooms. Of course the more expensive the homes, the more a buyer can expect to find. And with luxury houses in Dallas regularly pricing over $10,000,000, buyers can expect to see a ton of amenities the more significant their budget. New mansions in Dallas are available from luxury home builders like Alford Homes, Thomas Signature Homes, Bella Custom Homes, Bella Vita Custom Homes, Hawkins-Welwood Homes, Jauregui Custom Homes, Steve Roberts Luxury Homes, Sharif Munir Custom Homes, and Simmons Estate Homes. Considering looking at luxury homes, or selling a mansion in Dallas? Knox & Associates luxury real estate agents are experts, and we’d love to help! If you are looking at luxury real estate for sale, contact us to schedule showings of the properties that catch your attention. For sellers, our luxury REALTORS® will schedule a convenient time to meet for a consultation; create a custom, full-market analysis of your house; and formulate a fair-market opinion as to the best asking price for your home. We can provide up-to-the-minute luxury real estate statistics: current average asking prices on the luxury homes for sale; the sales' history of currently sold mansions; and information about broader Dallas, Texas market trends so that you can make a well-informed decision. Knox & Associates' luxury real estate agents are full-time, trusted, professionals. This means you will be teaming with a dedicated expert whose goal is to negotiate the quickest home sale possible with the highest net return to the client.